Time for a new blog banner! 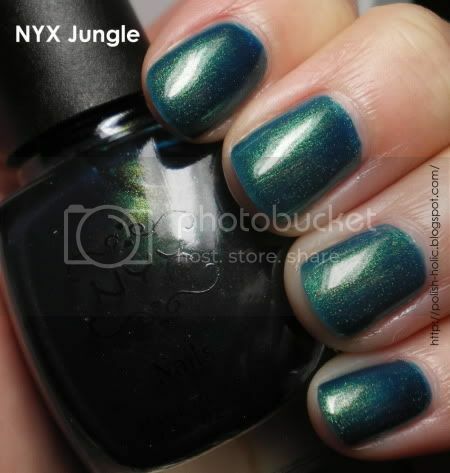 Jungle is a blue-polish-with-gold-shimmer green. I didn't realize how many of these were out there. And I own so many of them. Lol. Three coats with topcoat. It's actually quite sheer so required the full three coats. No other application issues. Vid of the Moment: Instead of a pic I have a vid for you guys. If you don't die of cute from this, then you have a heart of stone. That polish is STUNNING. And I've seen that video going around online, it's beyond adorable! I couldn't help but watch over and over, squeeing myself to death. Wow very nice! Looks like duochrome! That color is amazing...probably why there are so many of them! Oh, that polish is a awesome!! This is really pretty. Thank you for posting this!